The price will stick at GBP£30 + shipping per set. You will be able to pay via your Credit/Debit Card via PayPal, or (for USA customers only) personal checks will also be accepted. However checks will incur a bank handling charge (the bank knows how to dig the arm in for this) and of course we'll have to wait for up to 30 days for your check to clear. 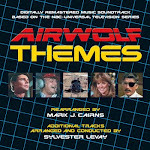 There will be 42 tracks on his sequel album overall which is quite a sizeable handful more than were even on the original 'Airwolf Themes' as we wanted to give the best value-for-money possible, whilst giving the widest selection possible. It is now being manufactured during March 2014 so we'd hope it'll be ready to launch by the end of the month. We now decided we won't be as it would take up too much admin time. As this will NOT be a mass-market release, will require engineering and production costs to be factored in for 42 brand new tracks (and the costs and licensing that massive amount of tracks - for any music album out there - will be huge. Most music albums have much less than this, like 10-11 tracks usually) and it will be a based on UK production costs (not American, European, Chinese or any of the other cheap, mass-produced markets), that, given 14 years' of inflation [including massively increased postage & Airmail costs -- of which we'll only use the premium Registered "Signed-For" service] will probably not be too far away from last time's costs (seriously), thus a lot more expensive than any big studio release. Anyway, the 2CD will be GBP £30 + registered shipping cost per 2CD set (we've increased to 42 tracks - YEAH, we've added more to Jan's CD1 - now up from 30+ which is horrendously high in music terms) and UK production costs have dictated the final figure. NO APOLOGIES FOR WANTING TO MAKE SOMETHING OF QUALITY! THUS WILL BE MORE EXPENSIVE! It's NOT being made to a price, but to whatever it costs to make it properly and to the premium quality we desire for it... and that's the price it will cost you all in the end, and I'm making absolutely no bones, apologies nor qualms about that at this stage. You've been fore-warned at this early stage guys and I'm not apologizing for wanting to make a quality product! But nobody ever complains about quality and quality costs. Simple as that. • 24pp Cover souvenir booklet incorporated into a new generation "Super Jewel Case"
Below are the final Release Teasers (with a lot of tweaks and refinements over the original Blog teasers!) for Jan's Main Themes CD1 and my Episodic Themes CD2. First to comment, FIRST to buy! Can't wait!!!! how come so limited there more 2000 people who love that soundtrack especially when you make it . last time sold out before i get one ,you need upped more instead 2000 5000 or somewhere like that ,people will be buy multiply copies ,i waited long time for this i be upset if i can't get it. Fair comment, however it took a few years to sell the original AWT 1000 before. With the ongoing worldwide Great Recession I don't think the money's around any more for that multiple copy lark to strike twice. A lot of folks are getting it really tough at the mo. 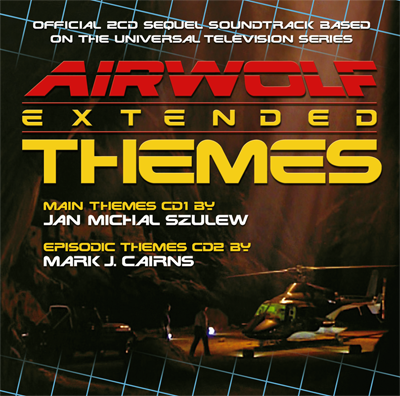 2k's the right level for a niche show like Airwolf. Anyway, more importantly, we'll see if folks like it first, or if the File-sharers leave us alone long enough to even buy one. LOL. Cant wait to get my copy!. sounds like its gonna be awesome! well done!